I grew up eating corn nuts. I loved them, and still to this day. I’m a bit cautious however eating them nowadays only because I think I may crack a tooth or something. 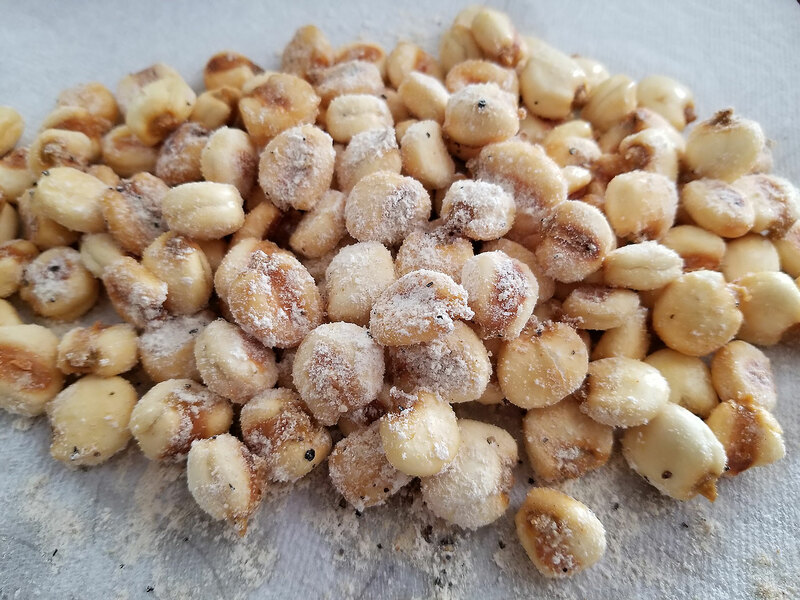 But corn nuts are something my boys love as well, and I figured what the heck, let’s make some homemade ones. I was thinking of what to seasons these corn nuts with, and came up with two versions. One using a Filipino sisig seasoning (you can find it in your Asian market), and the other using one of my son’s favorite seasoning blends, Slap Ya Mama. These corn nuts are really easy to make, come out a bit on the chalky side which is ok, and still pleased the boys. Feel free to use whatever seasoning mix you enjoy. Now you have a couple of options here. You can fry them or bake them. I default to the fry method, however if you are going to bake them, bake them at 400 degrees between 20-40 minutes turning every 10 minutes. You have to soak the beans overnight in a large bowl in cool water. The next day, drain the water, and them them stay in the strainer to air dry a bit. Sprinkle in the sugar and salt, and give them a good toss. Next heat up a pot and pour in the oil. Bring to a medium-high heat for a few minutes. Drop in a couple of corn nuts and see if they sizzle. If not, wait a few more minutes until they do sizzle. Fry the corn nuts, in batches, for about 15 minutes or until they get nice and golden. Move them around with a slotted spoon from time to time. Once they are golden, remove them to a paper lined baking sheet with a kitchen spider or slotted spoon, removing any excess oil, and let them cool slightly. While they are cooling, pour them into a mixing bowl, and add your seasoning, tossing to completely coat them. Repeat and serve. My oldest loved these, in particular the Slap Ya Mama version. Crunchy, salty, and delicious. These make for a perfect snack. Hope you enjoy!